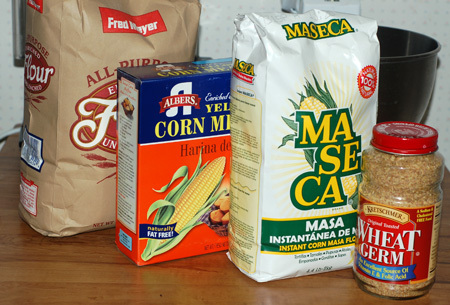 Yesterday was our 11th wedding anniversary, and my husband bought me flours—and no, that isn’t a typo. We don’t have the money to do anything extravagant right now, and I was out of a bunch of groceries, including all-purpose flour, so we went all around town running errands. Lunch out, jeans for Jeremy, and huge piles of foodstuffs for me to cook with—sounds like a good day to me. Running around Salem just reminds me of the extent to which I don’t get out enough. I made numerous observations pertaining to this and food around Salem over the course of the day, and thought I’d get them off my chest. Non-local readers, bear with me! Christo’s Pizzeria, our number-one choice for gourmet pizza in Salem, apparently moved locations—a year ago. That means it has been at least that long since we have eaten their fantastic Greek pizza… so not cool. At some point, our favorite little pasta joint, the Willamette Noodle Company, also moved locations—and then opened a second restaurant, the Willamette Burger Company, at the old site. These guys have great food and support the local community, so we’ll definitely have to try out their burger incarnation next time we get a hankering. While looking up info about the aforementioned restaurants, I stumbled across a rumor that the former owner of the Smokin’ Swine—a fantastic restaurant plagued by one bad location after another, making them difficult to keep up with—may soon be manning a mobile unit around Salem. That won’t make them any easier to find, but I’ll rest easier knowing that his food is available somewhere. Good barbecue is not easy to come by in Salem. I also stumbled across the recent uproar caused by an erroneous sign announcing the addition of a Trader Joe’s to the Keizer Station shopping center. Every Salemite I’ve spoken to on the subject has been dying for a Trader Joe’s (and/or Whole Foods and/or Wild Oats, etc. etc.) in our own town for years. It is a travesty that we have to drive all the way up to Tigard or down to Eugene for these stores, but apparently the management thinks the residents of the state capitol, second largest city in Oregon, don’t appreciate organic and specialty foods. It makes me cranky. To end my rant on a more positive note, I ordered Jeremy a care package of dark chocolate from Chocosphere for our anniversary/Father’s Day. This company, which I’ve written up before, is located in Tualatin, and has great customer service, not to mention delicious chocolates. 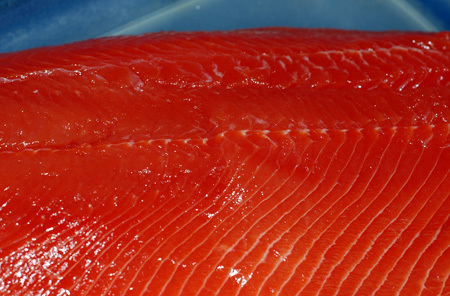 Moving on to the actual cooking, for our anniversary dinner, I was inspired by the discovery of brilliantly colored Copper River sockeye fillets at Costco. Farmed salmon very literally pales in comparison. This wild salmon has a very short season, so we always snap some up when it is available. I knew I wanted to cook the fish very simply, so as to let its natural flavor and meaty texture shine through, so I focused on some interesting sides instead. 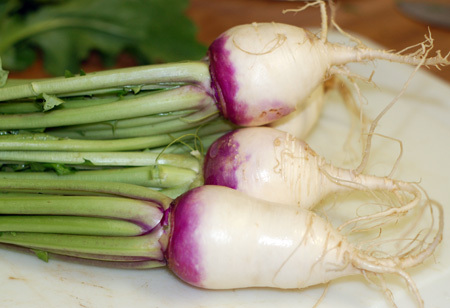 I still had some lovely purple-topped turnips from the farmer’s market to use up. After some contemplation, I decided to slice them up for a gratin, adding a Russet potato for bulk and a buffer against their somewhat bitter and radishy flavor. The gratin was cooked up in my 12″ cast iron skillet; I melted some butter in the bottom and layered on the potato and turnip, trying to distribute both evenly. Thyme-infused cream went over top, and when the lot was tender, I grated on some Pecorino Romano and stuck it in a 400F oven to brown up for 10 minutes while the salmon baked. I then sauteed some oyster mushrooms and diced onion in butter until they were nicely browned and tender, with mere splashes of balsamic and cream to finish. Sauteeing fresh mushrooms until they take on a lot of color both emphasizes their meaty flavor compounds and decreases their moisture content, greatly reducing their likeness to dirty styrofoam in my mind and complementing the salmon without being overly saucy. 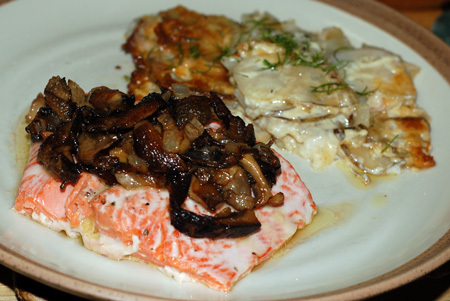 The meal came together well: The meaty salmon held up against the sauteed mushrooms, and the gratin was creamy and rich, with a very pleasant mild bitterness from the turnip adding interest. Jeremy gave it all rave reviews as he scarfed it down, and didn’t realize the gratin included turnips until I told him. I believe his precise words were, “Better than a restaurant meal,” and I would be inclined to agree. The recipe I used last night called for cooking the gratin in a heavy skillet, partly on the stove, and finishing in the oven. I used my cast iron skillet, and despite turning the burner way down, the bottom layer of my gratin was charred. Below, I’ve compensated for that by putting it back in a casserole and baking it off entirely in the oven. I’m very tempted to try the muffin-cup version next time I bring home turnips, however. Preheat the oven to 375F. Put the cream, thyme, bay, garlic, salt and pepper to taste in a small saucepan and bring to a simmer, then turn off the heat and let it steep to infuse the cream with flavor. 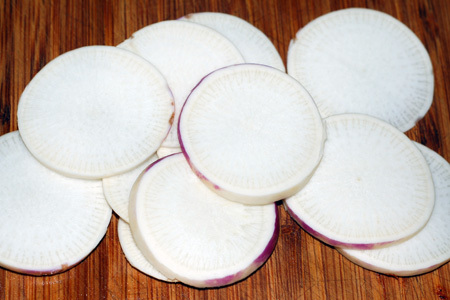 Meanwhile, use a mandoline to thinly slice the turnips and potato, skin and all; you want about 2 pounds of root vegetables altogether. Butter a small casserole dish (about 11×7) and layer in a third of the turnips and potato, distributing both evenly. Strain the warm cream and pour 1/3 of it over the turnip layer; repeat this layering process twice more, ending with the last of the cream. Cover the casserole with foil, and bake for 35-40 minutes. Remove the foil, top the gratin with Pecorino Romano, and bake for another 20 minutes, until bubbly and golden brown. A fork inserted near the center should meet no resistance. Allow to rest for 15-20 minutes to facilitate easier serving. Sprinkle servings with chopped fresh dill, if desired. Source: Slightly adapted from Epicurious and Food Network.